Mix together 1/2 ounce of the panko with 1 ounce of the Parmesan in a small bowl. Set aside. Gently combine with your hands the chicken, egg, 1 tablespoon of the herb oil, the remaining 2.5 ounces panko, the remaining 3 ounces Parmesan, basil, garlic powder, parsley, oregano and salt in a large bowl. Produce roughly 1 oz. golfball sized balls and roll them in the panko mixture. Heat the remaining 1 tablespoon oil over medium heat in an oven safe skillet. Brown the meatballs in the oil. Cover the meatballs with marinara sauce. Then cover with the grated mozzarella. 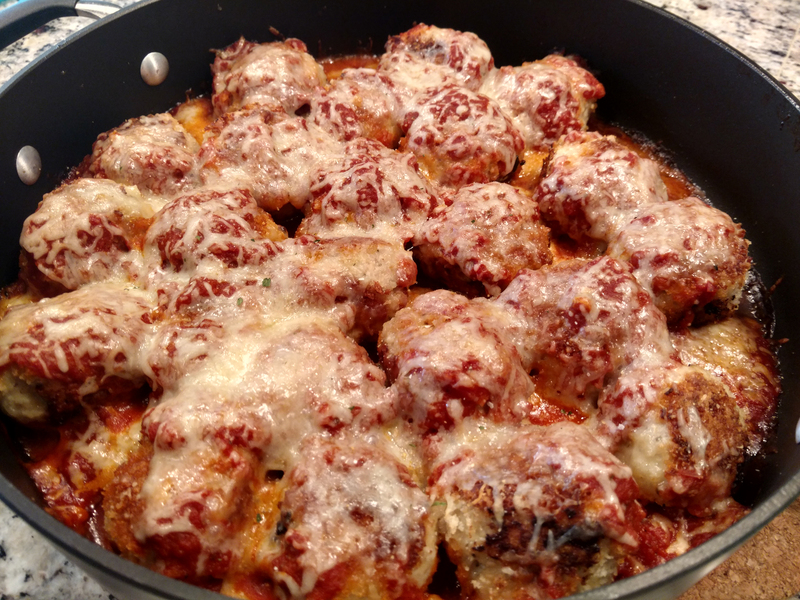 Bake until the meatballs are cooked through, about 165 degrees, and the cheese is melted. Serve over cooked pasta or on top of crispy bread.